A city to be explored. The secrets of Marrakech will blow your mind. We spent 10 days in this ancient city and learnt the DOs and DON’Ts to enjoy this jewel! After a shocking first impression followed by an incredible dinner, we decided to relax and enjoy the city. One more good night of sleep and we were ready to explore all the secrets of Marrakech. Morocco is a contradictory place: richness & poverty, West & East, old & modern, everything living together in an addicted frenzy. In total we spend 20 days in Morocco, time enough to get to know a bit of this country and to make our own list about the highlights and things to avoid. Our mission is to inspire and help people to travel more and better, so here is our Love and Road “Secrets of Marrakech: DOs and DON’Ts” ! For us Marrakech is all about: Food – Architecture – Handmade goods and Spices. Food is my favorite topic and deserves one entire post about it! Please wait till next Thursday and you will be tipsy with all the scents, colors and flavours. Marrakech is one of the oldest cities in Morocco. More than 1.000 years of empires, conquerors, trades and history. A mix of Berbers, Arabs and Moors people. During the centuries Morocco develop its life around the Medina (walled ancient city that exists in most of the Moroccan towns). It’s inside the Medina that we found precious secrets of Marrakech. Definitely it’s not easy to walk around the alleys and souks. Maps, GPS and your sense of direction will let you down. You will get lost and by surprise you will discover some jewels. Do not accept help or guidance from a strange on the streets. They know you are a tourist and sometimes they will act like a friend, but in the end you will be charge for an outrageous amount of money. Tourists have said to be harassed and threatened. If you need help to find your way ask to someone inside a shop, preferably the attendant. On your way you will find lots of children, old ladies and interesting characters. They can be awesome people and we do recommend to talk and get to know them. But be aware that unauthorised photographies can put you in a delicate situation. Always ask first! Drink lots of tea!! Mint tea and the Berber tea (a massive mix of herbs and spices. They say it’s aphrodisiac). Don’t forget that tea is not just about drink, tea time is a way to socialize, make friends and talk! Orange juice! Morocco is super hot in summer, you’ll need to be hydrated. Nothing better than a fresh squeezed juice! We paid just 4 Dirham per glass full of flavour. The sweetest oranges I have ever tried. If you are loyal to the same seller you get some free refill! Before start shopping do a henna tattoo on your hands and feet. Plenty of ladies will offer to draw and decorate your arm. Make sure to check the models first. I saw some ugly tattoos there. Get lost in the souks! There is no better way to discover all the Moroccan handicraft goods. Leather bags, shoes, antiques, chandeliers, pottery, copper and silver products. Don’t be shy, enter in the shop, ask the price and NEVER buy a thing without bargaining. Negotiation is cultural in Morocco, if you are going to buy something ask for half price and from there start the bargain talk. Learn about the Berber heritage. Many shops sell the Berber stuff: herbs, teas, natural medicines. In the jewish quarter we stopped by a Berber shop and met Jacob, he explained us about the products, we drank some tea and as a present I got Berber hand moisturising! Argan hand spa!! Visit the argan cooperatives. This golden gorgeous oil is made only in Morocco. You can see how the woman produce it, the smell, the quality. Ask for a free sample, try in your hands and hair. You will love it! A truly secret of Marrakech! Carpets is also a big thing around there. I still think they can even fly!! Woollen, silk and palm trees fiber. They use everything to make and embroider the colorful and dazzlingly carpets. Some of them are fire-proof! Ohhhhhhhh!!! When you get tired of the Medina and the souks, scape to the new town. Just outside the walls you can see the olive fields, new buildings and a shopping centre. More like a western world. 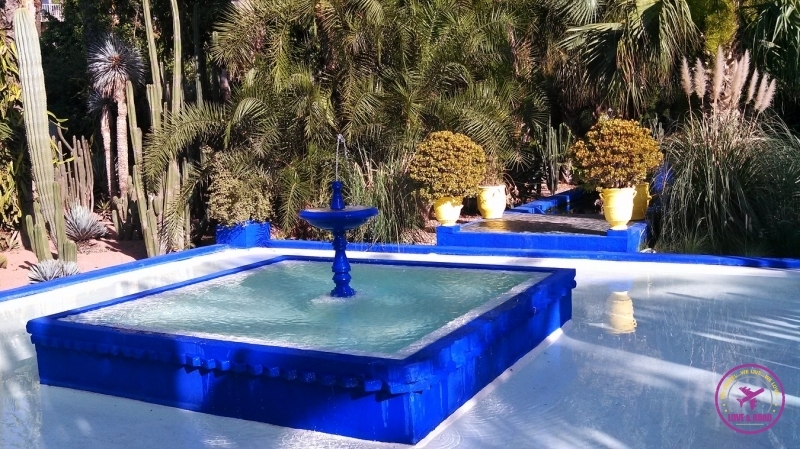 Still in the new Marrakech, a secret that needs to be discovered is the Jardin de Majorelle. it’s a oasis in the middle of the dusty and rush. Created by Jacques Majorelle, the garden was bought by Yves Saint Laurent in 1980. Beautiful nature, history and a sparkle of fashion in only one place. By the end of the day go to some restaurant roof top just to drink one more tea and enjoy the stunning sunset. 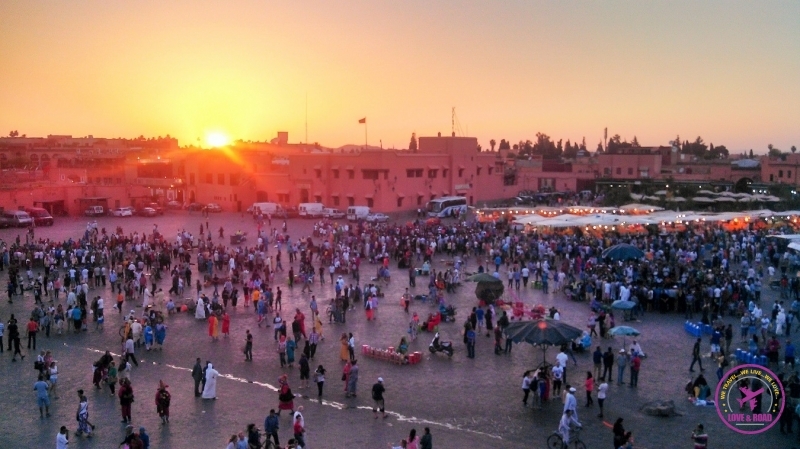 While the sun goes by, Jemaa el-Fnaa Square comes alive! A unique and enchanted view. During the 10 days we explored Marrakech we never got tired of this spectacle. Koutoubia Mosque: the main mosque of the city, you can’t get inside, but enjoy the design and the green square. Musee De Marrakesh: get the combined ticket to visit the museum and the madrassa. Money save tip. And they are really close to each other. Ali Ben Youssef Madrasa: stunning architecture. Maison de la Photographie de Marrakech: secrets of Marrakech and Morocco captured in frames. Palais de la Bahia: great architecture and a bunch of sweet cats. Palais El Badiî: stroll around the ruins and explore the underground area. Nice expositions in the museum too. Mellah neighborhood: the jewish quarter, it’s a hidden place. Arsat Moulay Abdeslam Cyber Park: green area in the middle of the Ochre City. Ensemble Artisanal Marrakech: a center of handcrafted goods and works. Hi There! I’m planning to go to Marrakech with 2 friends (women). Do you believe it’s safe? I’ve heard that maybe it’s not a good time to go there…. 1º – Take care with your clothes. You will se lots of girls wearing shorts and top, but believe me, it is better to cover yourselves up a bit. Show respect to their culture and religion and they will give you back respect and attention. 2º – Check the location of your Riad or hotel. 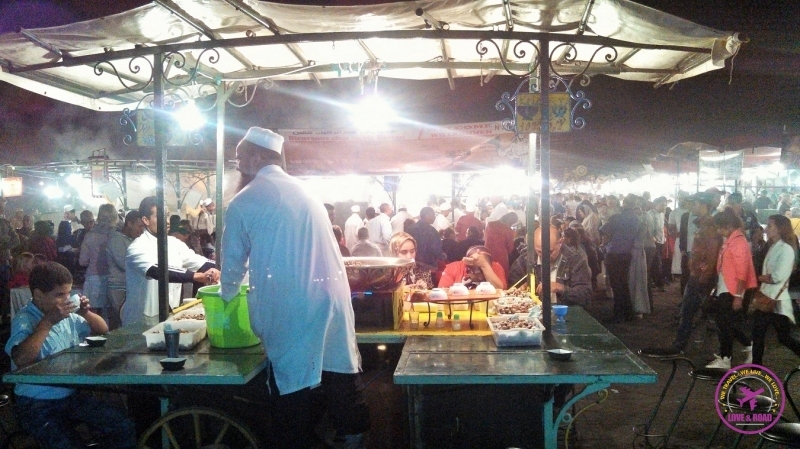 I recommend to stay inside the Medina, around Jemaa El-Fna Square. We stayed at Amour de Riad (we don´t get any commission for advertising them) and it was a great choice: clean, well located, cheap and with great people. 3º – Don´t accept guidance from stranger. There lots of people that will try to help you, but maybe some of them are there just for money and they can give you a hard time. So print your maps before travelling. If you are not sure how you can get from the airport to the hotel talk to someone in the riad and they will set up someone to pick you up. Once you are in Marrakech you’ll understand how the city and the culture work. For me took around three days to get used with it. All the poverty, the dirty streets and people begging was a cultural shock. But I learnt how to deal with and after a few days I started enjoy the trip a lot. Marrakech is a mystic city. Especially at night, you will see! Ahhh, by this time the weather is bit colder and you can get some rain. Are going just to Marrakech, or other places are on your plans? Great blog, Nat and Rob! Glad to have connected with you on Twitter. We haven’t been to Morocco yet but it definitely looks amazing and we’ve heard really good things about hitchhiking there. You’ve got some lovely photos here as well and if you like photography you should definitely take a look at our Travel Photography Competition. It´s a pleasure to connect with you too. We were looking your blog, and your story sounds amazing, really inspiring… Wish I (Nat) have the guts to do such an adventure trip. We don´t have many experience hitchhiking, but definitely thinking on get a bike and cycle through some countries. Let´s see what the future holds. About the Photography Competition, for sure we will take part!! Maybe I’ll post some nice Moroccan picture. Hope we keep in touch and if you need tips or advice about Morocco just let us know! All the best and happy travels!! I wouldn’t call the Jardin Majorelle a secret! It’s the nr 1 tourist attraction in Marrakech! These are some fantastic tips that you offer, I feel that Morocco is such an amazing place to go. I really want to hit all the the cities and the sites when I go an Marrakesh is definitely definitely one that I wont miss! P.S I love how your do’s vastly outweigh your dont’s which gives me a great idea of what kind of place it will be. thanks for stopping by Dante, Marrakesh is an intense ad interesting city. Nice blog, thanks for the info, we’re going next week! Agree, a week is not enough. We are planning another trip for Sept 2018! Be careful when you buy anything. We were deceived by local people offering seemingly good things and it turned out that they were a low quality products: the next day the silver paint came off from the plates, the quartz minerals were also painted. Being in the desert we decided to tip a great hotel service and gave a big tip to the hand of the boss of the hotel (with witnesses/some hotel staff around) with the indication that this is to be shared with everyone. As we had contact with one of the employees, we learned that the whole amount the boss have keeped for himself. My parents traveled to Marrakech many years back and they absolutely loved it – especially my mom who’s an expert at bargaining! This city has such a unique appeal and I’d love to explore every corner of it when I get the chance to. We just came back from Marrakech and are already thinking of going back next year! Whats the best way using money. $, €, £, credit cards. Are there ATMs for local currency. We withdraw local currency from ATMs, it was the easiest way.